Before I moved to Knoxville, I had a studio that was walled off from the larger, communal painting half of the "art barn" at Bucknell University. I was a graduate student for the art gallery on campus, and I was also taking a painting independent study. 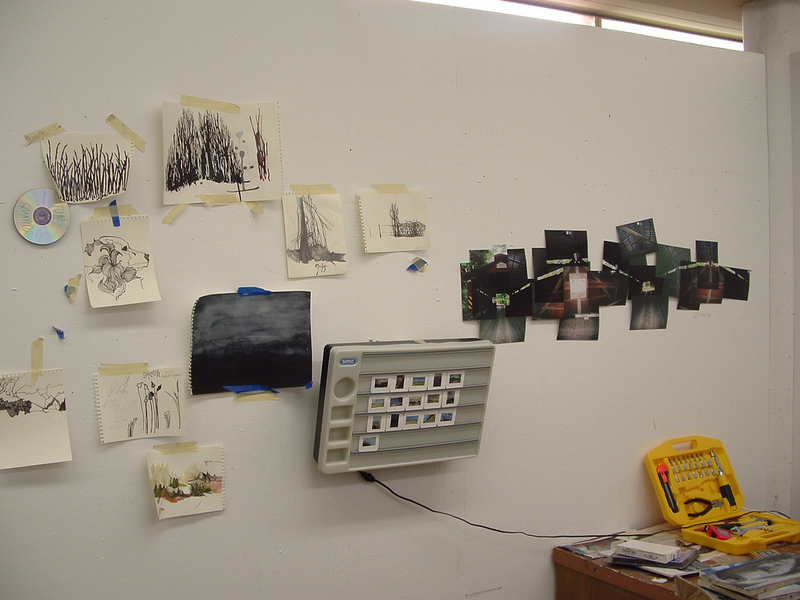 The painting professor gave me this room because I was older, and more dedicated to working regular, long hours. At first I was resistant to move from the communal barn to this smaller room. There were no windows! I like windows, and daylight, and to be able to see what is going on. However, I took to this space. It was about the size of the bedroom in my apartment. There was only one socket, but it was enough to run my hair dryer and boom box. 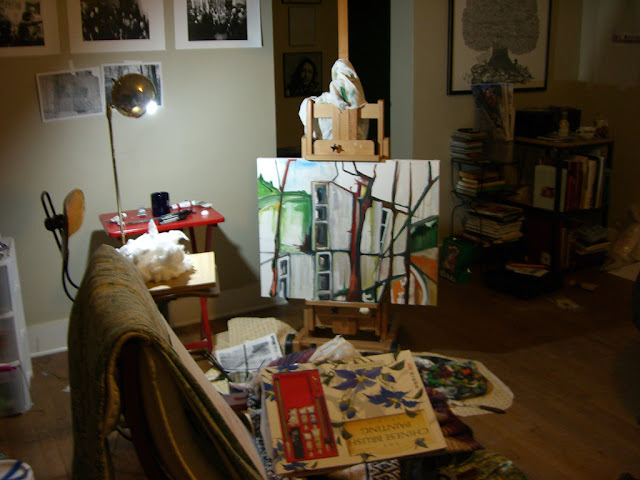 It had a long, heavy, wooden table -- I couldn't have lifted it without help -- two easels, and a chair. 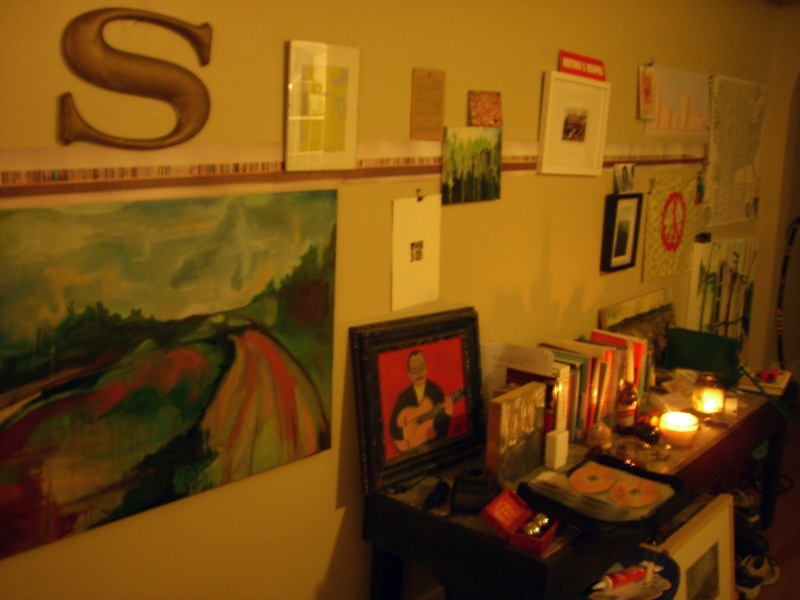 I covered the walls with pictures I liked, things I was thinking about, and my sketches. The room was a complete mess, and I liked it that way. I left everything strewn across the table, and this led me to use tools and media in ways I might not have. Because it was out, it was present in my mind, and easy for me to reach for and experiment with. 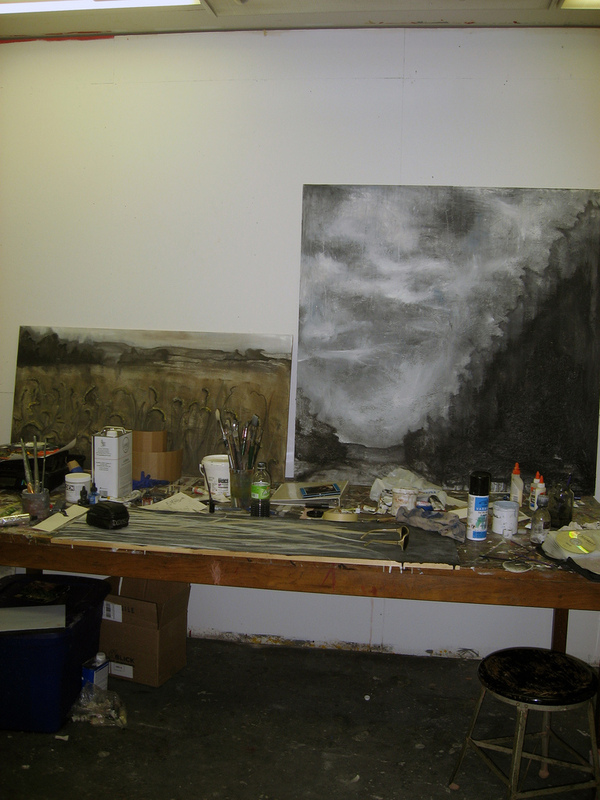 In this space, I could create without worry. I never thought twice about spilling anything on the floor, making too much noise, or dust, or ruining the walls. In Knoxville, I knew my living room would have to double as my studio space. I looked at some really ugly and small apartments, and some that were too expensive. Then I found mine. There are hardwood floors in the living room and lots of windows. All of my art things are in one half of my living room, and tucked in every available corner of my apartment. My apartment walls now double as studio walls, with a haphazard rotating collage of things on them. Operating this way for about a year and a half, I have discovered a few things about the way I work and what I like. I like having a completely separate place to contain all of this art making stuff. When I was a slovenly pig-teenager, I used to tell my mom that there is a reason rooms have doors. SO YOU CAN CLOSE THEM AND NOT SEE MESSES INSIDE. Right now there is a tripod in my kitchen, collaging material and a sketch board slid under my bed, and watercolors on my coffee table. I like keeping things out so it motivates me to pick something up and work on it for a bit...but I also don't like putting things away all the time either. Art messes aren't very conducive to having guests. Or for putting your feet on the coffee table. I like going to a separate place. It gets me in a mindset to get good quality work time done. I should never work with the TV on. But I do. I really like my PBS cooking shows, and I try to treat the TV like a radio, But sometimes I JUST HAVE TO LOOK OVER AT JACQUES PEPIN CUTTING THINGS UP. The TV is not a radio and not the same as music. Maybe with all this said, I really don't work better with a separate place. I might just need a little more self control in the tidying-things-up-and-not-being-obsessed-with-Jacques-Pepin area. Anyway. When I write things down, I become more accountable for my actions. I will be better at not multitasking with art.